On hearing Krishna’s enchanting pastimes, we may long to be with him and lament our misfortune at not being there when those pastimes were manifest. Such feelings are healthy if they increase our remembrance of Krishna. But they can be unhealthy if they perpetuate the misconception that access to Krishna depends on physical proximity. Our connection with Krishna is a function of disposition, not location. The Kaurava prince Duryodhana was Krishna’s contemporary. On many occasions, he was with Krishna in the same room. He even saw Krishna’s gigantic universal form. Yet despite his proximate location and his direct perception, he was never with Krishna – his heart was turned away and he never appreciated Krishna’s greatness or sweetness. Duryodhana’s spiritual blindness is evident at the start of the Bhagavad-gita (01.04). 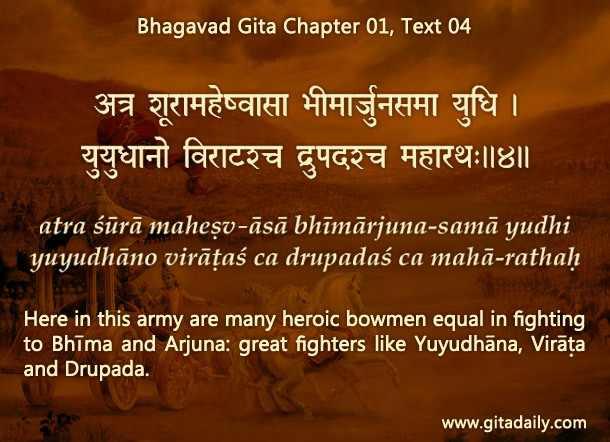 While assessing the two assembled armies, he mentions the opponents’ best warriors: Bhima and Arjuna. Yet he overlooks Krishna, who being Arjuna’s charioteer was right next to him. He goes on to list the prime players on both sides (01.04-01.11), but doesn’t mention Krishna even once. Because Krishna had resolved to be a non-combatant, Duryodhana considers him a nonentity. We may be hundreds of miles and thousands of years away from the place and time wherein Duryodhana was so close to Krishna. Yet we can come closer to Krishna than his inimical contemporaries were. How? By cultivating a devotional disposition. Such a disposition helps us appreciate Krishna’s presence in his deities, holy names, scriptures and in our heart. The more we appreciate his presence, the more we become attracted to him. And that enhanced attraction propels us towards his abode for an eternal life of love with him. Thus, striving to live with Krishna in disposition is the surest way to living with him, now and forever. Excellent explanation Maharaj !!! It helps.